Are Passive Houses the answer? How green is my Mac? Is Ruth Kelly going to save us? I keep posting about Passive Houses and I must move on to something new. But before I get there, a query has come up that deserves a detailed response. What is the difference between a Passive House and a Passive Solar House? Are they the same thing? If not, how are they related? A bit of history is order here. Passive solar houses have been around a long time, arguably since we started putting windows in houses, whenever that was. It is a term used to describe a design principle that seeks to orientate a house so that the main living areas face the sun. The idea being that the sunshine heats the house, even on the most gloomy winter’s day, and that if the house contains enough heavy material, this free heat is stored overnight and slowly dissipates. People got terribly excited about such concepts back in the 1970s and 80s. 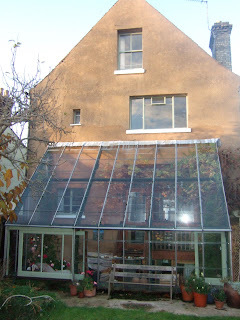 My very first building job, in 1980, involved doing a passive solar makeover of my house in Cambridge, carried out to the plans of Robert & Brenda Vale, who have since become the godparents of the UK’s green building movement. The house is still very much around (pictured here) and I revisited late last year: the current owner is aware of its history but is largely unimpressed by the thermal performance. “I don’t think my heating bills have been especially low, that’s for sure,” she told me, good-naturedly. She didn’t buy the house to save on heating costs: just as well. Whereas it seems some climates, notably New Mexico and Arizona, seem to be ideally suited to passive solar designs, wet and cloudy Britain most definitely isn’t. That’s not to say that you can’t get any benefit from passive solar design, but it’s far more limited than its proponents make out. You have to build a high thermal mass house, which doesn’t suit everyone or every budget; you have to get the orientation right, which isn’t always possible; and you have to take extra measures to ensure you don’t suffer from summer overheating. That’s not to say there isn’t still huge interest in passive solar as a design concept. Back in January, I was in the Building Centre Bookshop in London and there, on prominent display, was James Kachadorian’s The Passive Solar House. Kachadorian was custom homebuilder from Vermont who discovered passive solar design in the 1970s and built around 300 passive solar homes for his customers. He started designing in air ducts built into the floor, which he referred to as the Solar Slab and, despite lots of other people having very similar ideas at the time, he took out patents to try and protect his designs. When the patents ran out, he wrote the details up in this book, which he sees as a primer for passive solar designers. However, his schemes started to unravel when there were outbreaks of mould inside his some of his air ducts and also when people started to realise that his houses certainly weren’t “homes without heating” which is how Kachadorian was (and continues) spinning it. “A beautiful, comfortable home that needs a backup furnace (boiler) or air conditioner only rarely” is how he puts it in the blurb of the book. But the text reveals a very different story: there is a still a significant heat load and a typical requirement is for a 12kW furnace, not small by current standards. Insulate the house better and you wouldn’t require nearly so much heat in the first place. In fact, this is one of the problems with passive solar design. As you increase the amount of insulation in the fabric of the building, you decrease the heat load and you decrease the length of the heating season too. Instead of needing space heating on from say, September to April, a super-insulated house only requires it on from November to February. So your passive solar input just isn’t required so much and when you do need it, in the depths of winter, it’s delivering the least energy. The concept works best in the so-called shoulder seasons and, with a super-insulated house, you simply don’t need much extra heat at these times. So the two principles, passive solar design and super insulation, are to some extent working against each other. In contrast to the Passive Solar Home, the German PassivHaus standard sits firmly in the super-insulation camp. Which begs another question. Why exactly did they call it PassivHaus? Whereas I think the original use of the term passive solar was to distinguish it from active solar, as used for specific applications like solar panels, the Germans seem to be using the term in a different sense which I can only liken to lying easy of the planet. Rather than actively consuming lots of the world’s resources, a PassivHaus will sit there in the background not doing any harm. Being passive, in fact. Now a PassivHaus doesn’t need to be a passive solar house. It doesn’t need to be orientated towards the sun, nor does it requires tonnes and tonnes of thermal mass, though the great majority of German PassivHauses are masonry. These factors are taken into account on the modelling software used to determine the thermal performance of the design, and they will contribute to the overall performance, but they are not essential. So in summary, passive solar house is a concept borne out of the first energy crisis in the 1970s and is all to do with using sunshine to heat the house. PassivHaus is a 90s concept, a rigorous performance standard emphasising the importance of super-insulation. As so often, Wikipedia is excellent on the differences in definition. Search on passive solar and passive house and you get two very different entries. So what is a Passive House? The anglicised version of PassivHaus is not really defined at all. Hence the confusion. I have been using it interchangeably with PassivHaus, the German performance standard, but I guess there will be a lot of people around who are still far more familiar with the older concept of the Passive Solar House and will assume that this is what is being talked about. And I expect this confusion to persist for a while yet now that George Monbiot has latched onto the concept and seems to be writing about it frequently in his Guardian column. We can expect the phrase Passive House to get widespread media coverage in the months and years ahead. But I wonder how many people will be aware of the nuances at work here. Or how many of them will just resort to the sloppy thinking which defines it as neither as a passive solar house nor a super-insulated house but simply as a House that doesn’t need a heating system. Which, as it turns out, is not the case for either meaning. It's Passivhaus: "h" not "H". Passive Houses or PassivHauses or Passivhäuser are buildings that do not need a heating system, which is not the same as not needing heating. Yet any heating needed can be supplied by the MHRV system, essential for good indoor air quality anyway. Predominantly, though, these houses are kept warm passively, without requiring fuels or electricity -hence in my view the name is fully warranted! me i want a passiv haus, i dont want to pay a fortune on fuel to keep warm, i can deal with ventilation myself, by opening windows as required. If im buying a house i want maximum materials, massiv haus is just fine, not cardboard walls and maximised profit for the housebuilder and agents. 2 panes 3 panes? Ill pay the 10% extra for the extra pane. Guess Ill still be warm when my neighbours in their not massiv hauses cant pay the gas bills, and start getting back to victorian mortality levels.